I sit down on the bench end and study the shrouded body. A homeless man. I’ve never been homeless, but I’ve come close. One time, my “worldly riches” dwindled to 59 cents. It was scary but also delightfully humorous. “No one will fight over my estate!” I’d quip. My fingers touch the hem of the grayish blanket and then I notice his feet. Bare feet. Calloused feet. Feet that have trudged many miles. Wait! Those aren’t callouses—they’re crucifixion wounds. This is no ordinary man—this is a statue of Jesus! The work of Canadian sculptor Timothy Schmalz, the Homeless Jesus is a provocative, visual rendition of Matthew 25:40: “Whatever you do for the least of my brethren, you do unto me.” And like Jesus’ teachings in his earthly days, the statue has created quite a stir. When a cast of the Homeless Jesus was installed at St. Alban’s Episcopal Church in Davidson, North Carolina, some residents complained the statue demeaned their upscale neighborhood. Others found the sculpture “creepy.” Still others were inspired to sit at the feet of Jesus and pray to their Father in heaven. Nothing creepy about that! While the Homeless Jesus represents the atrocious number of homeless people in America and around the world—Albuquerque alone has thousands of homeless—I can’t help but also ponder the “other homeless.” I knew a widow who never received one visitor from her church after she buried her husband. She was emotionally homeless. Or newcomers who aren’t embraced by churches because they’re not the right ethnicity. They’re spiritually homeless. What about the outcasts who are shunned or mocked for whatever reason? That’s psychological homelessness. Are not our consciences pricked? Are not the “other homeless” also the least of his brethren? According to Schmalz’s website (sculpturesbytps.com), casts of the Homeless Jesus can be found in more than 50 cities worldwide—from Washington, D.C., to London to Madrid to the Papal Office of Charities in Rome. Another heart-rending Schmalz sculpture, When I Was A Stranger, portrays a hunched-over, transient Jesus, a tattered bag on his back. 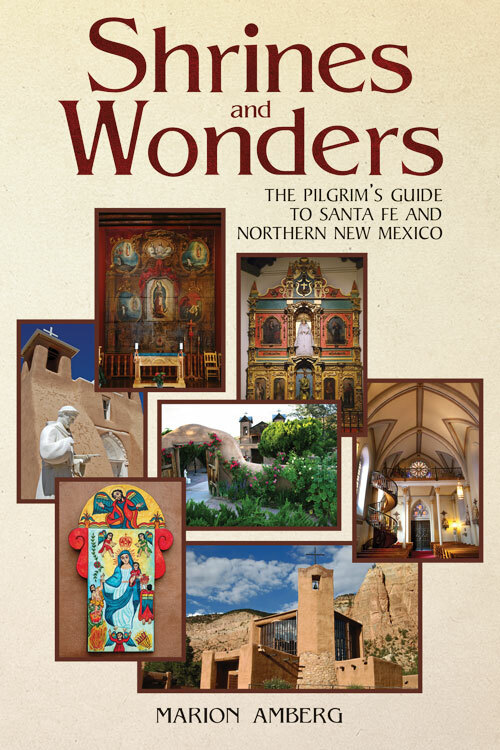 A pilgrimage site, Saint Thérèse of the Infant Jesus Catholic Church is located at 3424 Fourth Street NW in Albuquerque; (505) 344-8050; littleflowerabq.org. The church is also the home of the Little Flower Shrine. Outside, a life-size statue of Saint Thérèse seated on a bench graces the French Prayer Garden; inside are found relics of the “little saint.” Miracles and many wondrous answers to prayer have been reported here. Thanks for bringing this reminder of our responsibilities to help the homeless. Thanks, Dale. And yes, we are all responsible. Imagine our world if we all did our part! Marion…what a great story. Thanks. Thanks, Gloria. The sculptor’s “When I Was A Stranger” is also deeply moving.